Cisco Express Forwarding – CEF | CCIE or Null! In my last post about unicast Reverse Path Forwarding, I made quite a few references to CEF. CEF (known as Cisco Express Forwarding) is a feature built into every Cisco router and is enabled by default it’s really the feature that makes Cisco well Cisco. I figured I would take a little time and discuss CEF in a little detail. From a 500 foot view CEF is a method the router uses to forward packets, without utilizing any CPU cycles. CEF builds 2 cached tables in memory, these 2 cached tables are built from every entry in the routing table. So when the next packet arrives the router simply looks up the CEF entry found within memory to forward the packet, compared to sending the packet to the packet to the CPU for a route lookup and then forwarding the packet on. The Adjacency table maintains the layer 2 forwarding information for each FIB entry eliminating the need for the router to send out ARP requests. Now that we know the components of CEF, lets talk a little about how CEF interacts with packets as they enter the router. 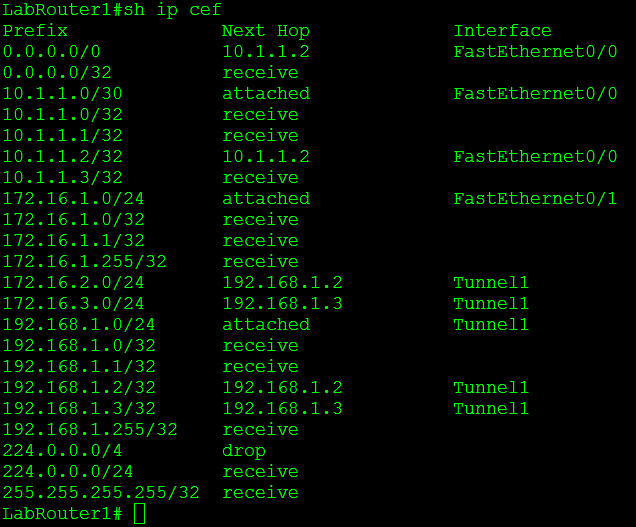 Next the router looks up the destination using the CEF table. Then the router finds the corresponding adjacency table entry. The router then adds the corresponding layer 2 information (found in the adjacency table) back to the packet and forwards the packet on. All from memory. Now remember the CEF table is layer 3 information so we have destination prefixes and what the next hop address is along with the outgoing interface. Now this was only the tip of the iceberg for CEF, and this post was only supposed to bring it to light on a real high level so more CEF related posts will mostly surface as time goes on.